The warm weather is here! If you’re heading out for some camping over the next few days, here’s hoping you’ve got your gear and site reservations in place. But if you’re using a recreational vehicle (RV), you’ll need to take a few extra steps before you’re ready to go. Whether you prefer a motorhome, travel-trailer or a pick-up camper, we’ve got a few basic tips to keep you and your RV safe on the highway. Your vehicle or trailer will have a gross vehicle weight rating (GVWR), which you should be able to find in your owner’s manual. If you’re overloading your vehicle, you’ll be putting a lot of extra stress on tires, brakes and engine – stresses your vehicle wasn’t designed to handle. If you’re carrying anything heavy, keep it as low as possible, and try to keep the weight of your vehicle evenly distributed. Uneven loads can make driving difficult and dangerous. If you’re not sure how much your RV weighs, one option is to have it weighed at your nearest station. You can find a list of weigh stations here. You might be ready to get out on the road, but you need to make sure your vehicle is, too. Besides the obvious checks of your engine and brakes, make sure to look at your lights and signals as well as your tire pressure and your towing setup as well. The last thing you want is to have your vacation plans spoiled by mechanical problems. Have a look at DriveBC and see if there’s any construction or other obstacles you might encounter on your journey. Don’t forget you can look up weather information and check out our traffic webcams there, too. Also be sure to drop by our Commercial Vehicle Safety and Enforcement Branch’s website. 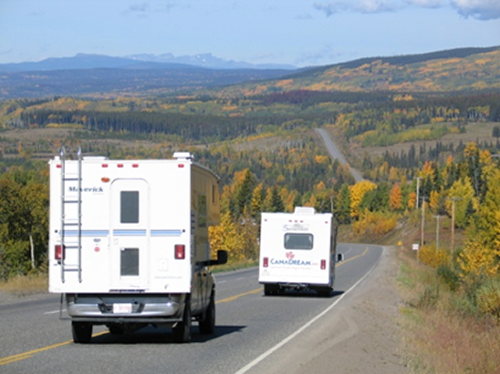 They have a lot of useful information on trailer and recreational vehicle towing as well as an excellent guide on gross vehicle weight ratings, brake requirements and Driver’s Licence Types For Recreational Vehicles. This goes without saying, but it’s all the more important when driving a large vehicle or towing a trailer. Be sure to leave yourself lots of time to get where you’re going and don’t hurry. Remember, you’re driving with a big load, and the heavier it is, the harder it’ll be for you to stop! So keep an eye out for other drivers and make lots of room between you and the vehicle in front. Hi, Wondering were I can find out info./regulations on hauling a camper and what length of campers can be hauled. I have a 2003 Ford 4×4 – 4 door Ford 150. I’ve heard stories about not exceeding box length with the tailgate down? We have sent your question directly to the good folks at the CVSE and they will be responding directly to you. Thanks for connecting with us here. Now with the weigh stations located on the highways of our beautiful province, can a non commercial vehicle just stop at the scale and weigh their vehicle? If so what is the procedure to drive on it? Maybe someone from the CVSE can provide that kind of information. Yes, you are welcome to use the scales. The self weigh scales are always open to the public. With all other scales, and due to commercial traffic, we ask that you touch base with the CVSE officer on site before being directed how to proceed.